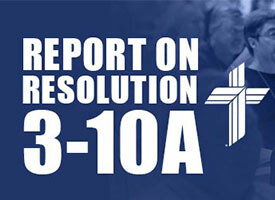 Upon reviewing the final report from the Task Force for Resolution 3-10A, LCMS President Rev. Dr. Matthew C. Harrison announced he is seeking more input from church workers on candidate and non-candidate status who are without calls, including returning military chaplains and missionaries. The task force report and Harrison’s letter are available at lcms.org/convention/task-force-updates/resolution-3-10A. The 65th Regular Convention of the LCMS, held July 20-25, 2013, adopted Resolution 3-10A, “To Appoint a Task Force to Study the Call Process for Returning Missionary and Military Chaplains and Other Rostered Church Workers Without a Call.” Harrison reviewed that Task Force’s final report in December. After reviewing the recommendations in the report, Harrison said he will form a focus group to examine the issue further. “The task force recommendations are very helpful, but I believe it will be important for me to listen carefully to the concerns of those directly affected by them,” he said. In his letter, Harrison said input from both the focus group and the task force report will be provided to the appropriate 2016 Convention floor committee to consider over Memorial Day weekend. Harrison said he hopes the Synod can “up its game” in helping the affected church workers on both candidate and non-candidate status and that congregations will give prayerful consideration to calling affected church workers who desire a call. Roger Drinnon (roger.drinnon@lcms.org) is manager of Editorial Services for LCMS Communications.